On the weekend I met a book publisher (who coincidentally publishes the book that one of my favorite films of the year is adapted from...). He was a very interesting guy and very passionate about books and the publishing world in general. He told us that when he turned 40 he was confronted by the fact that even if he read a book every week until he was 80 or so, he could only ever read around 1500 more books. And he set about forming a list of what those 1500 book would be, increasingly lamenting the fact that he would be forever missing out on more and more books that he would love to read but through his own mortality would never be able to read. The more he put on the list, the more he realised would be left off the list. It's really got me thinking about the never ending stream of films, books and music that enters my life. Just when you think you've explored a certain writer / director / artist / genre etc, you find out you're just scratching the surface. The more you know, the more you realise you don't know. Think about it though. If you knew you had a finite amount to read, watch and listen to, what would you choose? 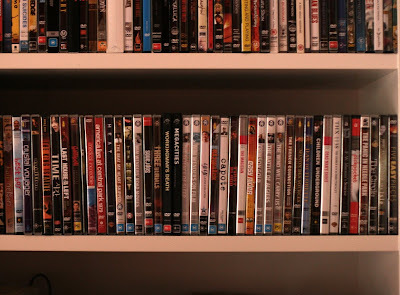 Above is a snap of the 'To View or Re-view' section of my DVD collection. Every film in this section I really want to watch (and every couple of weeks new films get added to it). If I was to watch one of those films every week or so, that's nearly a years worth of viewing just there. And thats not taking into consideration the constant MUST SEE films that are constantly coming my way, from the past, present and future.